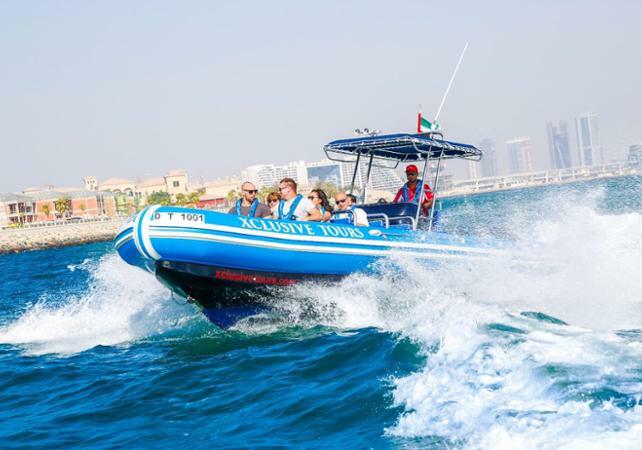 After our certified captain briefing , you will embark for a 90 mins tour in a speedboat, along the Dubai Marina coastline, around the island of Palm Jumeirah to end to Burj Al Arab view. Transportation from hotel is not included in the tour . Meeting Point : Xclusive Pocket Marina, Dubai Marina Walk, behind City Premiere Marina hotel. There is tour every hour of the day , starting from 09am to 5pm . No swimming is allowed on this tour.